Editor's Note 4.27.17: Investigations have revealed that a prisoner died of dehydration in a county jail Clarke overseas after being denied water for a week. The details of the 2016 death of 38-year-old Terrill Thomas reveal that he died of profound dehydration, after guards shut off water to his cell, with bipolar disorder as a contributing factor. His death was one of four in the Milwaukee County jail within six months. Democratic state lawmakers are among those calling on Walker to remove Clarke. Here is the backstory on Clarke's impunity. Just two days after Donald Trump’s stunning upset victory on Election Day, the short lists of prospective Cabinet members for the new administration began turning up in the press. Amid familiar and predictable national GOP figures and business leaders, two men whose highest office to date were in county government stood out—both as prospects to head the Department of Homeland Security. One was the just-ousted former sheriff of Maricopa County, Arizona, Joe Arpaio. The other was the still-sitting sheriff of Milwaukee County, Wisconsin, David Clarke. Whether or not he gets an appointment (unannounced as of press time), Clarke’s star is rising. In July, he delivered an endorsement address for Trump at the Republican National Convention in Cleveland, Ohio. By then, the African American sheriff was already a media sensation in national rightwing circles, where his fame has skyrocketed thanks to his repeated attacks on the Black Lives Matter movement. On Fox News and before Republican crowds, he can be counted on to discredit and marginalize the resurgent protests against police brutality and the deaths of black men and women at the hands of law enforcement officers. Clarke’s book, Cop Under Fire, is due out in March 2017 from a conservative Christian publishing house. In the book, Clarke calls for detaining American citizens suspected of terrorism indefinitely as “enemy combatants” and questioning them without a lawyer, according to the Milwaukee Journal Sentinel, which examined a prepublication copy. Obscured by his high profile is the fact that Clarke’s actual law enforcement authority in Milwaukee County is limited to patrolling state highways, maintaining the county jail, and policing county parks. He does all of those with a pugnacious, go-it-alone style that has made him the odd man out in local law enforcement circles. On the afternoon of August 13, a Saturday, a Milwaukee police officer shot and killed a twenty-three-year-old black man in a confrontation in the city’s Sherman Park neighborhood. Hours later, the first of eight stores went up in flames, launching two nights of what some called an uprising, others a riot. Clarke owes his political start to Wisconsin’s one-term Republican Governor Scott McCallum, who appointed him sheriff in March 2002, after his predecessor took early retirement. That autumn, he won the seat outright, running, as he has ever since, as a Democrat. Yet even then, Clarke was emerging as someone whose mind was far from that of others on his ticket. He blasted the city’s African American politicians in an email to conservative talk radio host Charlie Sykes. That was the beginning of a long, mutual courtship between Clarke and Milwaukee’s rightwing talk radio stations. Clarke was never a liberal, but early in his tenure he sounded like a certain kind of centrist-conservative black mainstream politician with his emphasis on personal responsibility over racism. When the Wisconsin legislature passed a bill in 2003 that would have lifted Wisconsin’s ban on carrying concealed firearms, Clarke joined others in law enforcement urging Democratic Governor Jim Doyle to veto the measure, which the governor did. Clarke still opposed concealed-carry when he ran for reelection in 2006 against a Republican who favored lifting the ban. A year later, though, Clarke reversed himself, and since then he’s been a Republican in everything but name. He has for years routinely sided not merely with the Republicans, but with their most conservative wing. 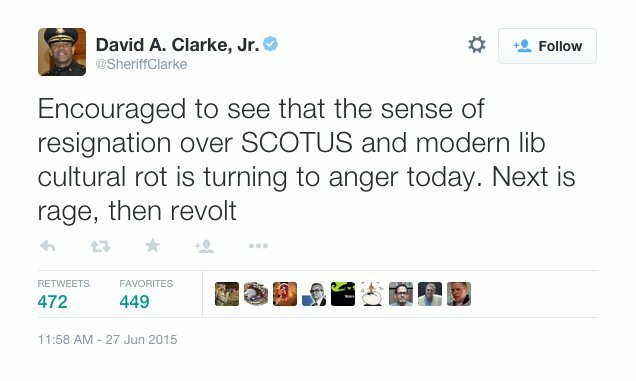 And since the 2008 election of America’s first black president, Clarke’s voice has gotten louder, his rhetoric more incendiary. Clarke’s rise coincided with the rightward push of the Wisconsin Republican Party that helped elect Scott Walker. Both were enabled in part by the same forces: Milwaukee’s conservative talk radio and a deep racial divide between the city frequently labeled America’s most segregated—where gaps between black people and white people in unemployment, poverty, and incarceration are among the nation’s worst—and its almost exclusively white suburbs. Hannity did not ask Clarke why he continues to assume the label of a party he says has been “hoodwinking the voters for fifty years.” Yet the results at the ballot box offer a clue. With four elections to date, Clarke has held his office with little difficulty by yoking together voters in overwhelmingly Republican white suburbs with those in equally overwhelmingly Democratic black central city neighborhoods. Clarke’s message had a certain appeal for black middle-class voters. Clarke counts on a certain amount of support just because he’s black. Before she died in November 2014, Annette “Polly” Williams—a popular African American state lawmaker for three decades who retired in 2010 and then became a talk radio host—endorsed Clarke in that year’s Democratic primary against a white opponent backed by virtually every other local Democrat, black or white. For years, Clarke has publicly disparaged Milwaukee Police Chief Flynn, who despite tensions over deaths in police custody and other conflicts has gotten national recognition as one of the nation’s more sophisticated law enforcement officials. The sheriff has also put out press releases assailing the Milwaukee County District Attorney’s office and the county’s chief judge. Another of the sheriff’s responsibilities has come under much darker scrutiny, though. In 2014, the Milwaukee Journal Sentinel reported that ten people died in the county jail, part of Clarke’s jurisdiction, over the previous four years, a mix of suicides and deaths from illness. In April, a mentally ill inmate died of dehydration after repeatedly being heard asking for water over several days. Clarke has not commented on the death, which remains under investigation; a private contractor providing medical services at the jail is also under scrutiny. Meanwhile, Clarke’s widely bruited crime-fighting solutions are being rejected even among law enforcement professionals. Clarke, through his county press aide, declined to be interviewed for this article. The perk of a D.C. job has attractions of its own, but Clarke might have other reasons to be looking for the exit—namely, hints in Milwaukee that his bizarre bipartisan base is ripe for fracturing. Up until now, running as a Democrat in solidly blue Milwaukee County has been his ironic saving grace. But this time around, suggests radio host Harris, the sheriff may pay a price among black voters for his Trump endorsement. Political insiders acknowledge several potential challengers have already been privately approached, some of them African American. What a bitter irony for Clarke to make a soft landing in the Fox News universe or on the Trump team, after more than a decade of lawman demagoguery has left him too unpopular to keep his job at home. Erik Gunn is a Wisconsin-based freelance writer. Erik Gunn is a Milwaukee-based writer. Guy's a clown, literally. What's w/that clown hat?